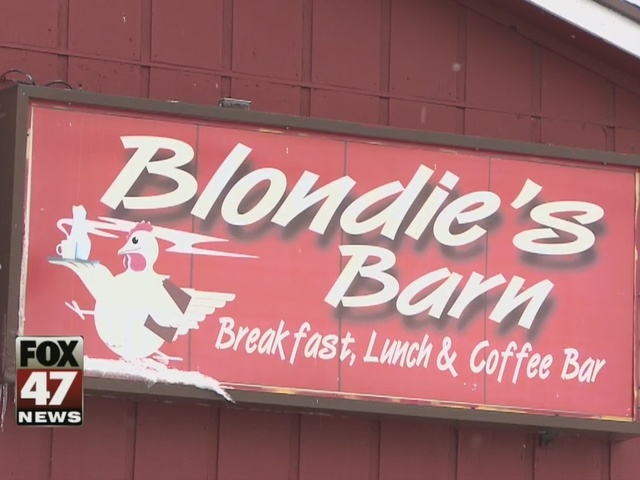 Blondie's Barn is giving back. "My family decided we just wanted to have atmosphere with my family," said Dawn Manuel, a.k.a. "Blondie," "and anybody that has nowhere to go can come in and have Thanksgiving lunch with us." Manuel and her daughter, Suzanne, run the brunch spot, Blondie's Barn at Haslett and Marsh. And this week, they're rolling up their sleeves and firing up the ovens for Thanksgiving. "On Wednesday we start cooking turkeys 24 hours, we make 25 turkeys," Manuel said. They're hosting free Thanksgiving lunch, for people who have nowhere to go. "If people do come in single, then they're sitting with a bunch of other people," Manuel said. "I walk around, we all walk around, and just chat and it's just kind of like a party." And since they started the tradition three years ago, Suzanne says word's spread fast. "Every year it kind of spreads out, the word spreads, and it will become bigger and bigger," Manuel said. "It's a family atmosphere, anyone can come, no matter what your financial circumstances. It's just a fun couple of hours to come and eat lunch," Manuel said. A lunch with 300 pounds worth of potatoes and 25 turkeys. They think there will even be leftovers, which they box up and hand out to the homeless on Thanksgiving night. Which Blondie says is the least she can do after ten years of support from her community. "The community's been amazing with me, as a business and a person and it's just a way to give back to the community," Manuel said. Other places are hosting free lunch and dinner on Thursday.